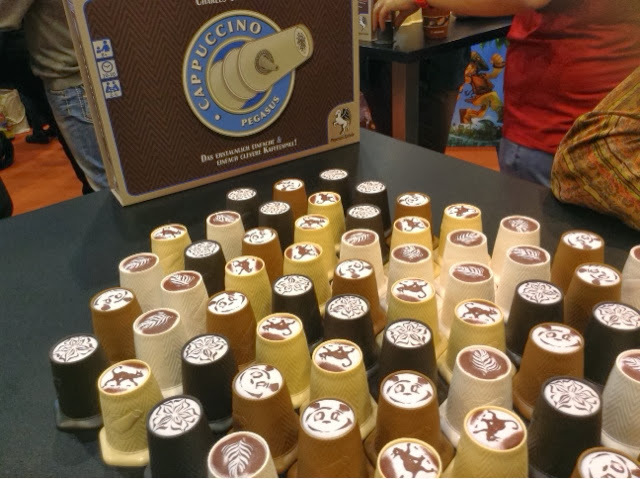 I walked by Pegasus Spiele's booth many times but had never the intention to try their new release - Cappuccino. It wasn't until I saw the lovely prints on the cups that my attention was captured. I love great art in games so I stopped to admire the roses so to speak. It so happened that a couple came along and wanted to play so we started a really quick game. 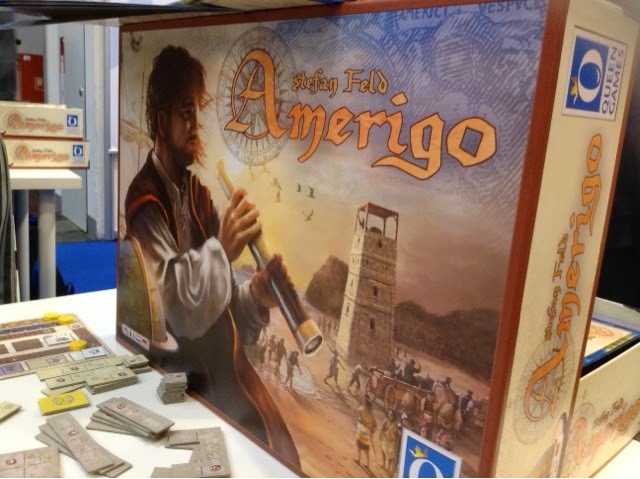 Amerigo was big at Essen 2013. Not just for its box size but also for the sheer difficulty in getting a table for a demo. That's all folks. Done and dusted. It's been a great experience and I'm glad & extremely fortunate to have been able to take in all this gaming goodness with a great friend for company. 4 full days with people who share the same passion for the hobby is nothing short of exciting and liberating. Being able to geek out without any judging looks is indeed a blessed thing. So we have ventured into the youtube realm and its a quick review of one of Uwe's recent releases, Glass Road! Do give us your reviews and comments so we can improve upon and see how we can continue our video reviews. Unfortunately there's gonna be another :( face cos I don't have much to update for today. I left my ipad mini with a lady for a project and so I don't have much photos for everyone to ogle at. Today was JAM packed. I mean CRAZY packed. Possibly cos it's the weekend crowd mingling around with the regular crowd. We were literally rubbing shoulder to shoulder with not much space to really get around. And I would say it was mostly this way till near closing time. Push Your Luck Podcast: Episode 23 -- How Games can change the world! In this episode, Eric is joined by his wife Serene and Scott Nicholson, to discuss on how Games can indeed change the world. This podcast was inspired from the TED talk where renown game designer Jane Mcgonigal (http://janemcgonigal.com/) gave a talk called "Gaming can make a better world." This has been quite an enlightening episode for me to record and I hope it will give our listeners a broader view of the world of games (boardgames, video games etc) and what people are doing to help change the world through change their perspectives on games. Anyway, its amazing how even though you are roaming the same halls, you just feel like there's always something new and exciting you want to do. 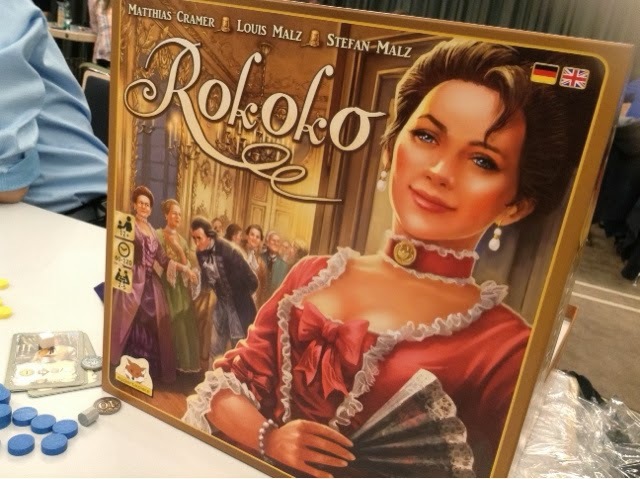 Rokoko was one of the top games that I was eagerly looking forward to at Essen. So I went to the booth shortly after visiting Eagle Games, but to my own surprise, I struggled to pull the trigger. I hesitated and eventually Dion bought it instead so that we can try and whoever likes it will keep it. Traveling with friends is indeed a blessed thing. Well, played it we did. We had a 4 player game that lasted almost 2 hours including rules explanation. I read the rules before so that went pretty quick. 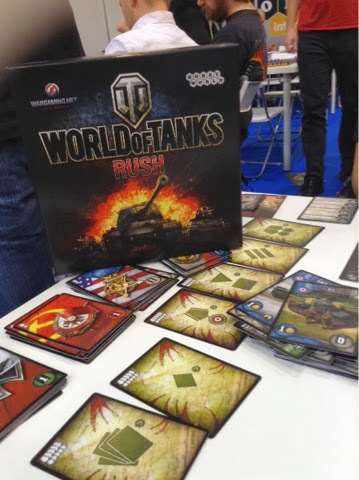 The first demo we managed to get into was for World of Tanks: Rush. A friend wanted to pick this up so we heading there after dumping our buys at the hotel. Well, our day 1 loot ! Well, we're here !! 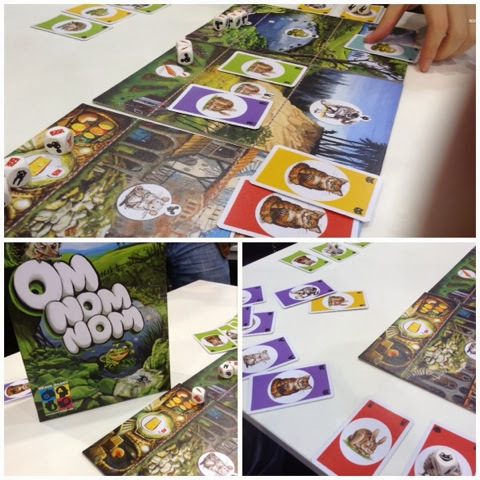 and we ( barely ) made it past day 1 of Essen. Dion is about all ready to pass out. Haha. 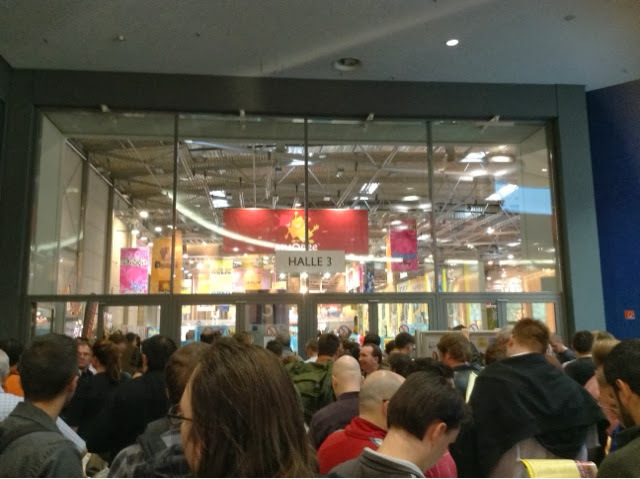 The picture above is the queue to get into hall 3. Wasn't as long as I expected so that was great. This is my first con experience so I can't compare it to others but I will say its a big enough scale IMO and after day 1 we went through halls 1 & 3 pretty much just glancing at most on offer and buying what we decided were "hot" and might not last till tomorrow. This post will only be some very simple pictures of what I took ( which wasn't much since I had games to lug along with me ). If possible I will do separate posts on my imprEssens of games. Hur hur. 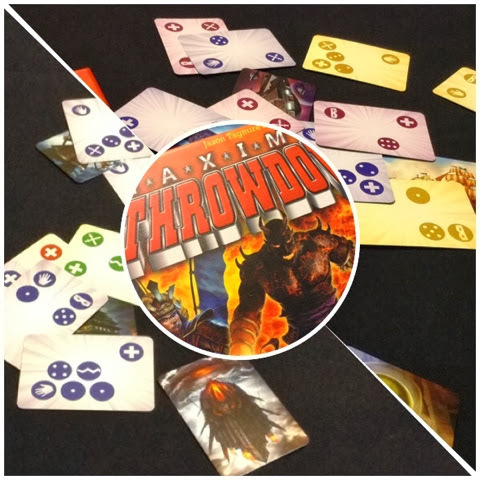 Maximum Throwdown is a simple and silly dexterity game where players each control a faction represented by cards and are trying to toss these cards onto the playing area so that the card touches a pre-existing card and that most of their faction symbols are showing; while at the same time covering those of their opponents. wait who were you again..? ﻿ A lot of micro games have been released in 2013 and it does seem as if everyone is jumping on the band wagon. In this post, we will look at Mascarade which is in the same vein as Coup and see how this compares with the other micro games of similar nature. If you have played Coup or to a lesser extent Love Letter, Masacarde will be familar to you. 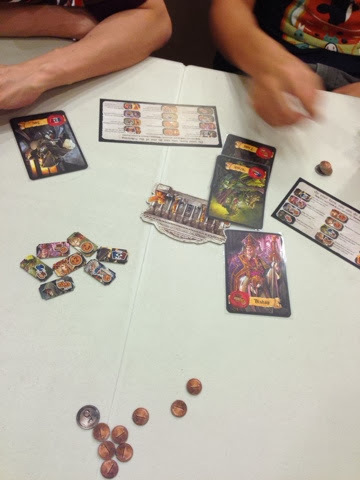 Each player will be dealt a character card which is open information to everyone at the start of the game. Then all cards are turned faced down and the game will begin. Each player will take a turn until a player has accumulated 13 coins (or 10 if you have a specific character) and is immediately declared the winner. 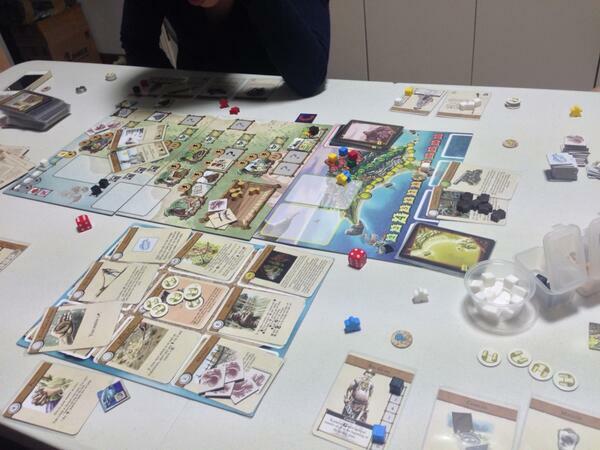 I have had very good experiences with Robinson Crusoe (even though I haven't reviewed it yet, sorry about that!) so when I heard about another game that involves survival and preparing and escaping from an island, I was intrigued. Besides the theme and one or two mechanisms, Castaways is quite different from Robinson Crusoe. Castaways is a semi-cooperative game where players have to survive long enough to be able to prepare for the eventual rescue off the island. Players will need to provide for the group on a daily basis (i.e. food and shelter) as well as explore the island and to build / forage for equipment which will allow them to get off the island. Mechanisms wise, its an action selection with a choose-your-adventure element that ties it all together. Suburbia, which was released at Essen 2012, is ( in my opinion ) probably the best city building board game out there at the moment. 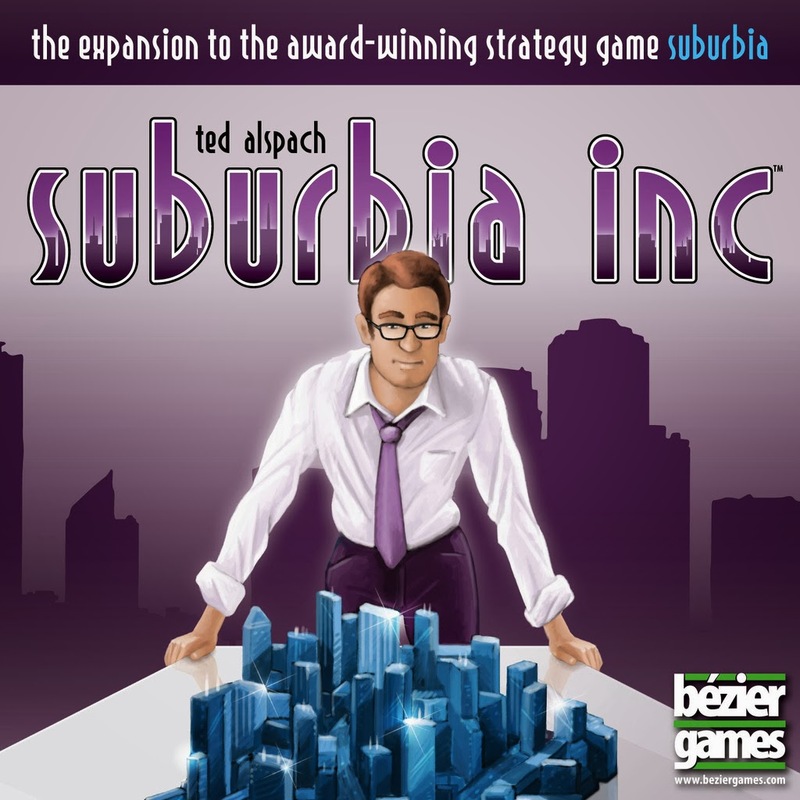 One year later, we have its first expansion set titled Suburbia Inc.